It’s one of the questions Child Life Program Manager Sandy Westfall hears most often from Doernbecher patients (and, occasionally, employees) when they first meet Hope, Doernbecher’s new facility dog. Below, we answer more questions about the dog who’s bringing hope to our halls, one smile at a time. 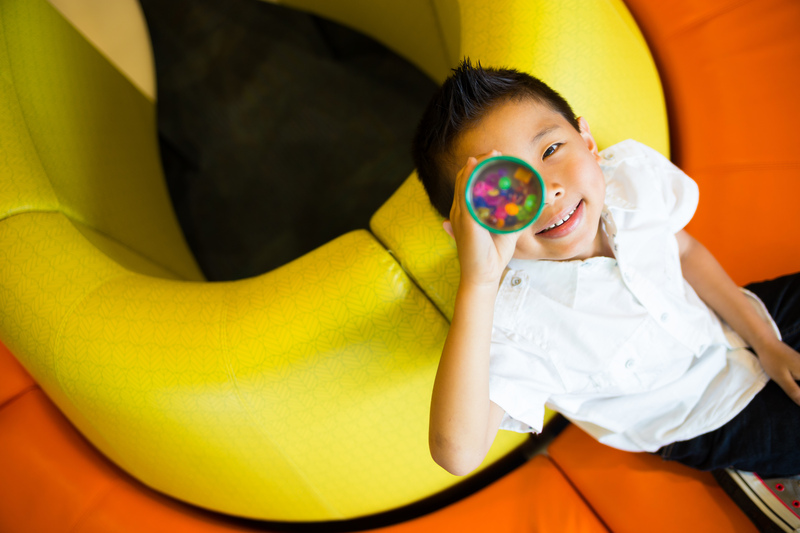 What does Hope do at Doernbecher? Hope’s impact extends far beyond patient rooms. 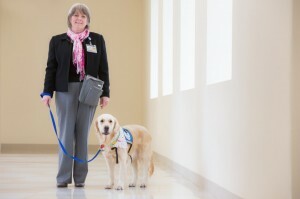 Sandy brings her along to meetings, where OHSU employees can be spotted crouching down to get some quality Hope time. The duo inevitably meet new friends when walking between units or when Hope’s headed outside for a break. Hope’s schedule does allow for some downtime, and she enjoys well-deserved naps in Sandy’s office. 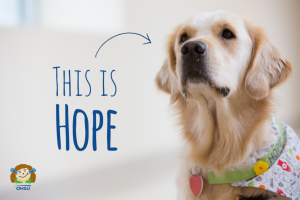 How is Hope different from a therapy dog or a service dog? A facility dog’s training is much more extensive than that of a therapy dog, lasting about a year and a half. Unlike service and guide dogs, Hope was trained to serve more than one person. She came to Doernbecher in January from Assistance Dogs of Hawaii, a non-profit organization that provides professionally trained dogs for people in need. Hope began her training when she was just 8 weeks old, undergoing rigorous health and temperament screenings and learning more than 70 commands. Hope is also handled by a professional: Sandy underwent rigorous training as well, traveling to Maui for an intensive program that included an overview on dog psychology, giving instruction and the hygiene measures that are necessary for a hospital facility dog. Hope lives with Sandy and the two carpool into work each day to make the rounds together. What makes Hope a good fit for Doernbecher? Assistance Dogs of Hawaii founders Mo and Will Maurer selected Hope, an English Cream Golden Retriever, for her role because of her calm demeanor. Not many dogs are well suited for a hospital environment, but Hope is not an easily distracted dog. The screenings she went through in her training helped ensure that she would be a good fit for Doernbecher patients and families. What does Hope like to do in her free time? When she isn’t snuggling with our patients, Hope loves a good game of catch. Like any true Oregonian, she also enjoys hiking and trips to the beach. Hope comes to us thanks to Doernbecher Children’s Hospital Foundation board member Kate McCoy and her husband, Craig, who brought Assistance Dogs of Hawaii to the attention of Doernbecher administration. The McCoys believed that a facility dog would bring hope, love, joy and healing to Doernbecher patients, families and staff, and they made a generous gift to help establish the Hope Fund within the Doernbecher Foundation. Thank you, Kate and Craig! Follow along with Hope’s adventure using the #dbhope hashtag – we’ll also be sharing Hope photos and stories on Facebook, Twitter and Instagram. I had the privilege to meet Hope in the DCH elevator. Such an exceptional and amazing dog! Truly awesome! Good job Doernbecher! I saw Hope in the hallway of DCH and I started hopping up and down because I was so excited to meet her! She is the sweetest dog! um…yeah I got goosebumps from this. Love! If we don’t work in Doernbecher, will there be other opportunities to meet Hope? I saw her featured in an article on The Oregonian’s website, and was so excited for the new OHSU “employee”. This is so amazing! I’m so happy to hear this. I hope you will also post her stories either here or somewhere else on the intranet. I know I am not the only person who does not do social media. We’ll plan on sharing Hope photos and stories here on Healthy Families as well as on our social channels, Mercedes. Thanks! What a concept and a bold move! Very exciting and novel idea to bring joy to our Patients! I am thrilled and so proud of Doernbecher for incorporating Hope into the hospital’s care services! Hope and Sandy have brightened my day each of the 3 times I’ve had the pleasure to visit with them in the hallway. I can only imagine the joy and comfort they bring to children. Thanks for not limiting Hope information to social media! I think this may be the one thing I am thoroughly jealous of not working on the main campus. I think Hope needs a walk down to CHH. Reading this made me tear up a little. What a wonderful idea. Looking forward to seeing Hope on the Hill! As the evening HUC on 10 North, I get to see Hope a lot. She’s a very sweet dog and I can tell that she loves her job. 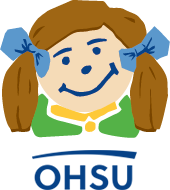 I saw her just the other day helping a little boy working with PT in the hallway – encouraging him to stand and start moving. That same day, she also helped comfort a very stressed-out little girl. She had been crying not long before Hope came into her room, jumped on her bed, and snuggled with her. Hope instantly brought a smile to the patient’s face. Sandy is a real trooper in taking on the role as Hope’s handler and caregiver, and I want to personally thank her for helping get Hope to the OHSU/DCH team! The only thing that would make this story better would be if this dog was not bought from some breeder, but rather was a rescue dog. Any information on that? I hate supporting the breeders out there, too many of them, and not enough regulation. Sounds like she is an awesome dog though, regardless of her origin. Thank for your comment, Anita. You can learn more about Assistance Dogs of Hawaii and ask any questions you may have here: http://assistancedogshawaii.org/about-us/. Thanks! So glad to see this! I am working with Facility Dog, Clove III, of Canine Companions for Independence. These dogs bring so much joy to the people they interact with. Clove and I would love to meet Hope sometime and perhaps compare notes or do a play date! Congratulations on the placement. I heard all about Hope from my daughter Amanda who I think was one of the first patients Hope went out to see. I would love to share with you some pictures, wonderful pictures of my daughter with a big smile because of Hope! We are so fortunate to have Hope as our dedicated therapy dog, and very blessed to have our other animal assisted therapy teams as well! 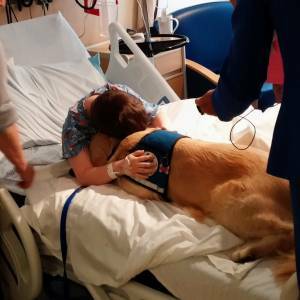 Just a very friendly reminder that not all of the dogs you see here at OHSU are therapy animals available for life-affirming snuggles, some are service dogs who should be left alone to do their jobs (and their handlers’ time and privacy respected). Welcome Hope! We’re so glad you are here brightening everyone’s days!